On October 7, Digital Check and its UK distribution partner, Checkprint Ltd., will host an educational seminar in London, focused on that country’s upcoming transition to electronic cheque clearing. After years of planning, the British banking system is slated to “turn on” its image exchange system for the first users on October 31, ramping up to a fully electronic system over the next 9 to 12 months. 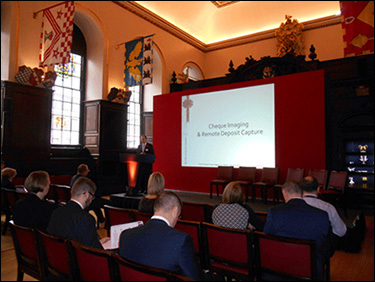 The London event will be Digital Check’s fourth seminar in the UK, and will focus on what to expect from the upcoming transition. In addition to presenters from Digital Check and Checkprint, Bank of Montreal will speak about their experience implementing RDC in Canada, which recently launched its own electronic cheque clearing system to great success. The October 31 rollout date represents a “soft launch” of electronic clearing for British banks, with most major financial institutions expected to send and receive limited numbers of cheques as a pilot program – but not required to make the full transition until next year. In the meantime, some banks have already been using cheque scanners for internal purposes, while several other significant players in the market have announced plans to install image capture systems in their branches by the fourth quarter of 2017. The UK Payments Council had originally intended to phase out cheques entirely, having voted in 2009 to close the country’s cheque clearing hub by 2018. However, public and political pressure led the group to quickly reconsider, and in 2012 it was decided to modernize the system instead. Under the current system that is being replaced, paper cheques are transported to and from a central clearinghouse by rail in a process that often leads to 4 to 6 days of float. Nearly half a billion cheques are still written by Britons annually – far less than the number used in the United States, but still enough to rank the country among the highest per-capita users of cheques in the world.